Watch a short video , it is played automatically, if not save it on your harddisk fistly. Jedovnice is a small town famous its lakes. 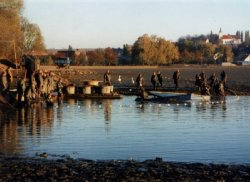 The date of the begining is unknown but fishing has had a long tradition in Jedovnice. The first notice comes from 1741 .The oldest remark is from the year 1371 when Jedovnice was established and Budkovany village too. Tunklov pond was established on the fields under Harbech in 1437. Dymák and Floriánek ponds have been in this area for several centuries. They were used for mill drive and iron mill. Other ponds like Veselský, Dvorský were disestablished. The lakes and ponds were used as a cheap source of energy and of course for fishing crop. The first notice about fishing comes from 1900 year. Since 1931 the lakes have been owned by municipality, in 1967 was Olšovec lake declared as a vacation spot, the Budkovan lake was rebuilt into three smaller ones, called Budkovan, Dubový, Vrbový. Since 2002 the lakes have been rent by Olšovec, s.r.o. company. The Olšovec lake became a very popular among the tourists for relaxation and recreation. New cottages were bulit in the last years and the number of visitors is still growing, especially in summer.